BY MR. MORLEY B. COLLINS. The subject upon which I am about to address you has been dealt with from many standpoints, but I venture to assert that it has never before been reviewed from the standpoint which I am fortunate in being able to take up to-day. It is not my intention to deal with the history of St. Piran, the circumstances surrounding his mission to Cornwall, or the many wonderful legends with which his name has been associated: these events have already been made known by antiquarians of note whose opinions are rarely questioned: In fact the address delivered by Mr. Thurstan Peter to a large assembly on the site of the oratory in August last must still be fresh in the minds of many. Firstly. The extent of our excavations both in and around the oratory. Secondly. What has been found. Thirdly. The steps taken to preserve what remains. Whilst considering these points I propose to make a few brief references to the style, method of construction, and details of this oratory as compared with other oratories in Ireland. The oratory of St. Piran, popularly known as 'the lost church' is situated in an obscure hollow of the sand hills which adjoin Perranporth on the northern side, its exact locality being shown on the ordnance map. The gable ends of the building were first noticed above the sand early in the 19th century, but it was not until 1835 that its excavation was successfully undertaken. The public are still greatly indebted to the late Mr. William Mitchell, at that time living at Comprigney, who carried out the excavation in a most praiseworthy manner and was the means of bringing the oratory to light. Unfortunately not long after Mr. Mitchell's excavations were complete the sand again enveloped the building, which remained buried until about twenty-five years ago when several gentlemen of the locality excavated the sand from the interior only, and erected a strong iron railing around the same. This was an unfortunate course as the pressure of the sand externally at once exerted itself and forced the masonry out of perpendicular. Mr. G. C. Hancock, the landowner, having recently conveyed the building to trustees for the county, a contract for the building of the preserving structure now erected over the oratory was signed on the 11 May, 1910. The first operations consisted of the manufacture of about 1,500 hollow concrete blocks at the Bolingey mine, Perranporth, the sand and gravel from the mine heaps being used for this purpose. The actual work at the oratory commenced on the 6 July last. The first of these shows the oratory at the commencement of operations; you will observe that the sand level coincides with the levels of the tops of the walls with the exception of a small portion of the western gable, the steps leading from the iron gate to the interior of the building, and a portion of the modern altar stone,3 may also be seen. The south wall is buried in the sand, and there is a considerable growth of coarse reed and other vegetation. The general level of the sand in the interior approximately corresponds with the height of the top of the altar stone, which we have since ascertained to be four feet above the original floor level. 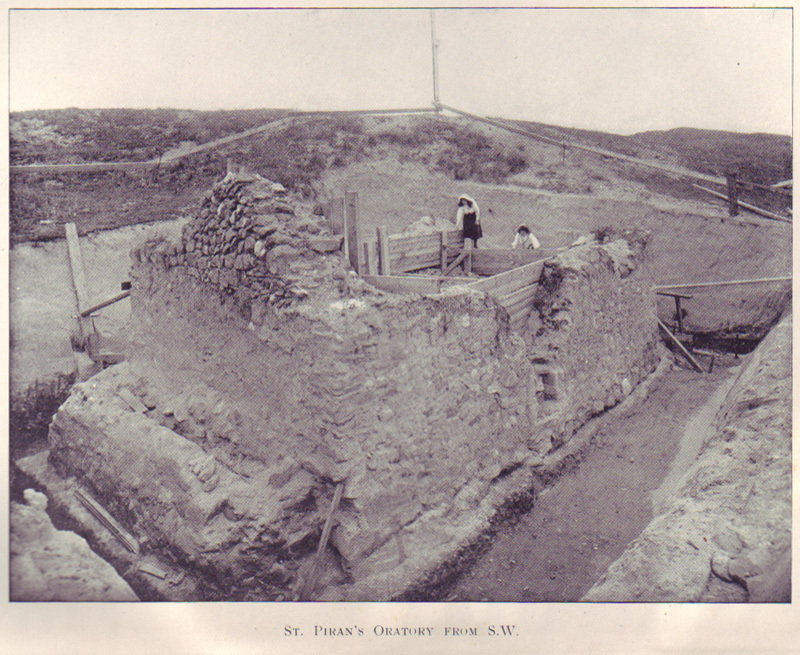 After having shored up the old walls a trench was taken out all around the oratory, about five feet wide at the sides and from seven to eight feet at the ends. As this trench sank deeper we discovered at intervals many pieces of coarse sand stone similar to that used for the carved work around the south doorway, as well as several carved stones corresponding with the moulding on the door jambs, and others, to which I shall make reference later. As the depth of the trench further increased a part of the south doorway was found to be remaining intact. From information I have obtained relative to buildings of this class in Ireland, I find that both niches and windows existed, in one case as many as four niches, although not all at the eastern end; these niches generally are approximately of the same dimensions as those given in Mr. Mitchell's notes, and it is difficult to believe that he should have made the grievous error of describing a window as a niche. The north wall has still a quantity of the outside face remaining in fair condition, but the inner face has fallen with the exception of about two feet from the floor level. There are no apertures in the north wall. I now come to the south elevation: the position of the doorway has not, I think, been interfered with, but the window and the masonry around it are somewhat puzzling and have the appearance of having been disturbed. I turn to the western end of the building which is the highest portion now remaining. There are no openings in this wall, but at the base is an erection, which for my purposes I refer to as a dam; this structure runs the whole length of the western end. It is constructed of yellow clay and stones, the masonry being entirely different in character from that of the oratory itself. A peculiar feature of this dam is, that it is carried around the north-western corner, the clay and masonry being carried into the north wall, and underpinning it. In my opinion this dam was erected to form a protection to the western end, which apparently was in danger of being damaged by water. In fact, the N.W. corner shows signs of having been affected, and repaired. We found clear indications of a water course adjoining this dam, and portions of the wall forming the other side. I attribute this erection to a later date than that of the oratory, as skeletons were found lying transversely underneath the same. During excavations in the interior we found on the stone bench at the S.W. corner several worked sand stones evidently placed there with the intention of being preserved. The excavations inside revealed the rough stone benches as shown,5 also the lime plaster floor which has a brownish appearance on the exposed surface, and is quite soft owing probably to the dampness of the site. With reference to the altar, the stone erected by Mr. Haslam and inscribed by him 'S. Piranus, D' was found to be placed upon a rough stone base, and is four feet above the floor level. We have found several sand stones of about the same thickness which may have formed part of the original altar stone, also two carved sand stones similar to that shown in the sketch. It has been suggested that these formed a portion of the outer edge of same. From the cross section shown you will notice that the walls lean inwards to some extent. Of course this is partly caused by the pressure of the sand before referred to, but it should be noted that the eastern and western ends also are built in this manner. No trace of the doorway arch has been discovered by which its construction could be even conjectured. With reference to the jamb moulding, I find an example of a similar moulding forming part of the architrave and cornice of the arched recess formerly existing in the eastern end of the Priest's House at Glendalough, attributed by Dr. Petrie to the 8th century. The use of sculptured heads on the arch occurs very frequently, especially at later periods. Both the style of the moulding, the reproduction of heads of animals, and human beings both grotesque and natural can be found in the earliest examples of Irish art. No mortar was used in the construction of the masonry. Mr. Mitchell referred to the walls as being plastered with lime plaster. Small lumps of this were found in various places, but nowhere does it remain intact upon the wall. The colouring of the walls with lime appears to have been customary even in some of the timber oratories. Many skeletons have been found and there are numerous interesting facts connected with these finds which time does not permit me to refer to. Its only door is in the west end, and a small window in the east end. Dr. Petrie says that each of the gables terminated with a small cross, the sockets of which now remain. The stone roof of this building is formed not by cut stones, but by each course of stones overlapping slightly the course below. This is of a similar character to that at Gallerus, the stones being not so flat or regular. The door in this case also is in the western end, with a small window in the eastern end. This building was of the same period as the last. It was a general custom to place the door in the western end, but I find a reference to one oratory stating that owing to its position on the sea coast the doorway was built in the south side, and the same might apply to St. Piran's oratory. St. Patrick's Chapel, Ardrass, Kildare. This building closely resembles St. Piran's oratory. It is described in a paper read before the Royal Society of Antiquaries, Ireland, by Lord Walter Fitzgerald. The south elevation contains the doorway and window. The east end contains two windows, one in gable, the other a two-light window, nearer the ground and similar to the south window. There is a small window in the west end. The roof of the building is described as having an appearance not unlike the sides of an upturned boat. It is composed of small flat stones, laid step fashion, projecting one beyond the other. There are three niches in this building. The oratory of St. Kevin at Glendalough, built in the 6th century, is in a similar style. You will remember I referred to the leaning walls, and you have no doubt noticed the object of this in the oratories I have referred to. It has not been established what was the nature of the roof of St. Piran's oratory, but the inclined walls point to a stone roof as in the other instances; but the walls are not inclined to such a great extent. If the roof here was not constructed of flat stones, then the builders were merely imitating a style when they erected the walls in this manner. With reference to the preservation work, having excavated all around the building to the foundations, which we found were one half on the solid earth and the other on the sand, a wide base of concrete has been put in to carry the covering building and to strengthen the foundations of the oratory. This having been done, a building of concrete blocks has been erected with a concrete roof, completely enclosing the oratory. The building is lighted from the roof and provided with a strong oaken door. The walls of the oratory are to be permanently shored up with small buttresses and concrete-encased steel. The question of the drainage of the site is one which calls for attention, as there is now a depth of over five feet of water in the building; when this is dealt with you may then rest assured that the remains of what is undoubtedly a building of historic and national interest is well protected and preserved. I must acknowledge the information I have obtained from Dr. George Petrie's valuable work on the 'Round Towers and Ancient Architecture of Ireland' and other works of a similar nature. Mr. Morley Bray Collins died 17 Feb., 1911, at the early age of 26 years. Had he lived his fine taste and architectural skill would have given him a good position. Extracted from the Journal of the Royal Institution of Cornwall, Volume XVIII, Part 2, 1911, pp390-397. 1. See Journal no. 50. 2. Mr. Collins showed seventeen diagrams. 3. i.e., the stone placed E. and W. by the rev. Wm. Haslam, and now to be removed. 4. See Mr. Mitchell's diagram, Journal no. 50 as above. Mr. Haslam states that he found it built up and opened it. See his Oratory of St. Piran. 5. These are shown on Mitchell's plan above. 6. Mr. Collins here showed by diagram how the doorway may be reconstructed, using the portions recently excavated and the heads now in our museum. 7. Mr. Collins then showed drawings of the oratory at Gallerus, Co. Kerry, erected in the fourth or fifth century, of flat stones from the locality.